Κάντε κλικ εδώ για να λαμβάνετε ενημερώσεις σχετικά με τις νέες προσφορές στον περιηγητή σας. Μην χάσετε όλες τις φανταστικές προσφορές. Επιτρέψτε τις ειδοποιήσεις στον περιηγητή σας. Ανακτήσει τα διαγραμμένα ή απρόσιτα αρχεία από το σκληρό δίσκο και τα μέσα αποθήκευσης. Magoshare Data Recovery 2.0 ήταν διαθέσιμο ως προσφορά στις 17 Οκτωβρίου 2017! Magoshare Ανάκτηση Δεδομένων είναι ένα από τα πιο ισχυρά σκληρό δίσκο το λογισμικό ανάκτησης δεδομένων. Το μόνο που δεν μπορεί να ανακτήσει τα διαγραμμένα αρχεία, αλλά επίσης να ανακτήσει τα χαμένα αρχεία λόγω σχήματος, να διαμορφώσετε, τη διαγραφή, λογικό σφάλμα, σκληρό δίσκο συντριβή, OS αναβάθμισης/επανεγκατάστασης, λοίμωξη από τον ιό, διαμέρισμα απώλεια, απροσδόκητη δύναμη μακριά δεν επιτρέπεται η πρόσβαση, και άλλους άγνωστους λόγους. Εύκολο Mac λογισμικό αποκατάστασης στοιχείων για να εύκολα και εντελώς ανακτήσει τα χαμένα αρχεία στο Mac OS. Developed by Informer Technologies, Inc. Developed by Disc Soft Ltd. There is no setup.exe/gcd in use today, the setup.exe provided by the vendor is unsigned and is the same as the trial installer offered on the vendors site. When activating the software using the key provided in the enclosed readme.txt it requires an internet connection to a server whose host name is http://doyourdatasn.com/ which leads me to believe there is some sort of business relationship with an old regular giveaway vender Do Your Data which has given away recovery products here in the past. 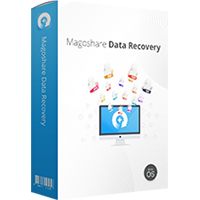 "The Best Hard Drive Data Recovery Software | Magoshare"
It does not offer the ability to create an image file of the failed drive to work from rather than the failed and possibly worsening drive like the best recovery programs do. 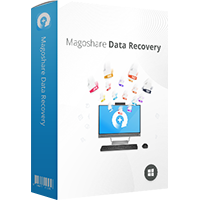 Magoshare Data Recovery Software offers 100% safe & efficient data recovery solution to completely recover lost data from hard drive or storage media"
Not true because it only works from the failed/failing drive and therefore is adding to the wear on the mechanisims and media. Also 100% efficiency implies that everything recoverable even file fragments will be recovered... that would be forensic level recovery which this does not offer. There is no quick scan option and it first enumarates all the files on a given drive including those simply deleted and then procedes to scan the entire drive and looks like it is going to take some time now on this 1.2 TByte partition estimated 3 hours 10mins remaining... 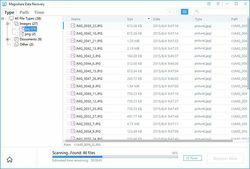 Although one can navigate the results presented so far and preview certain file types while the scan continues in the background. The provided setup.exe file has one detection on virustotal that is purely heuristic in nature and likely from scareware product (eGambit) There is no setup.exe/gcd in use today, the setup.exe provided by the vendor is unsigned and is the same as the trial installer offered on the vendors site. When activating the software using the key provided in the enclosed readme.txt it requires an internet connection to a server whose host name is http://doyourdatasn.com/ which leads me to believe there is some sort of business relationship with an old regular giveaway vender Do Your Data which has given away recovery products here in the past. 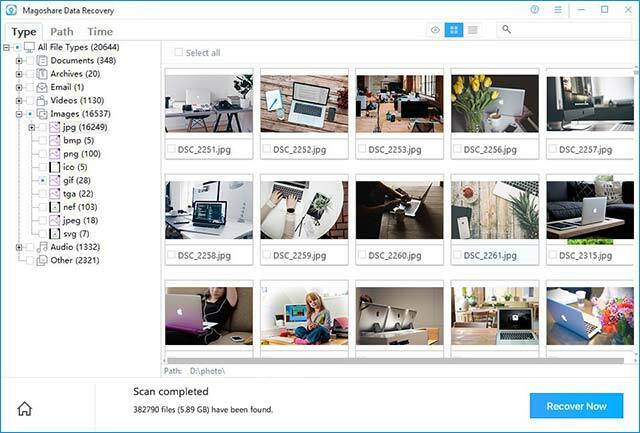 https://www.giveawayoftheday.com/category/publisher/doyourdata/ The vendor does make some pretty much unsupportable marketing claims: "The Best Hard Drive Data Recovery Software | Magoshare" It does not offer the ability to create an image file of the failed drive to work from rather than the failed and possibly worsening drive like the best recovery programs do. and "100% Efficient Data Recovery Software Magoshare Data Recovery Software offers 100% safe & efficient data recovery solution to completely recover lost data from hard drive or storage media" Not true because it only works from the failed/failing drive and therefore is adding to the wear on the mechanisims and media. Also 100% efficiency implies that everything recoverable even file fragments will be recovered... that would be forensic level recovery which this does not offer. There is no quick scan option and it first enumarates all the files on a given drive including those simply deleted and then procedes to scan the entire drive and looks like it is going to take some time now on this 1.2 TByte partition estimated 3 hours 10mins remaining... 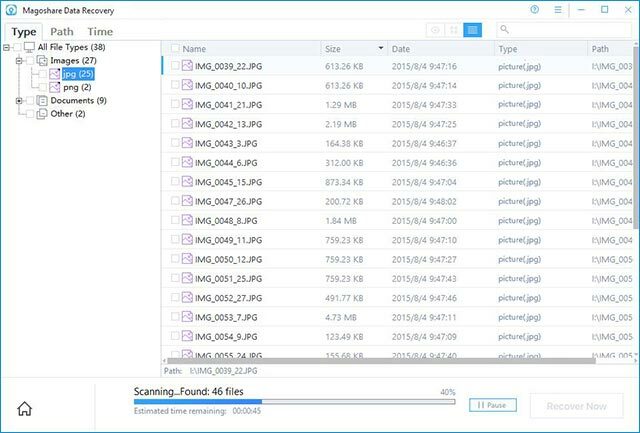 Although one can navigate the results presented so far and preview certain file types while the scan continues in the background. Mario, give me a couple more hours for the first scan to complete... 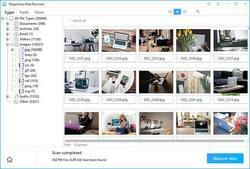 Since I have several other data recovery programs including some that do support creating and working from image files rather than the failing drive it is surplus to my needs but I cannot say if it is worth YOU downloading or not, that is for you to decide. 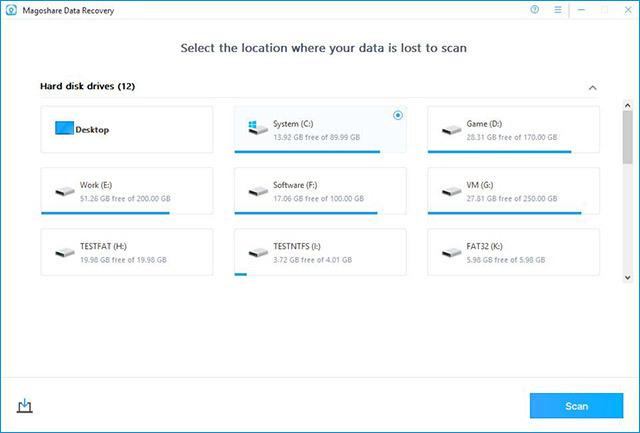 And for my personal needs I don't tend to rely on data recovery but prefer keeping important data in multiple locations so if one location fails it always exists somewhere else, i.e. multiple backups. Mario, give me a couple more hours for the first scan to complete... Since I have several other data recovery programs including some that do support creating and working from image files rather than the failing drive it is surplus to my needs but I cannot say if it is worth YOU downloading or not, that is for you to decide. 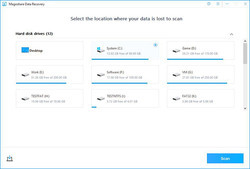 And for my personal needs I don't tend to rely on data recovery but prefer keeping important data in multiple locations so if one location fails it always exists somewhere else, i.e. multiple backups. Could it recover even from bad HD that are not shown "Computer" list? From crashed hard disks that OS can't see them. Could it recover even from bad HD that are not shown "Computer" list? From crashed hard disks that OS can't see them. dudi, that depends if the drive is shown device manager and disk managment list. If it is not even shown there then that means the controller circuitry of the drive is faulty and, without replacing the controller board with an identical model and revision controller board from a working donor drive or new, no recovery software can access the data. If the drive does show up in device manager and disk managment interfaces but not as a discrete drive letter in "Computer" list then there is a chance that software based rocovery could recover some data if the heads and platters and motors are still working at design spec. dudi, that depends if the drive is shown device manager and disk managment list. If it is not even shown there then that means the controller circuitry of the drive is faulty and, without replacing the controller board with an identical model and revision controller board from a working donor drive or new, no recovery software can access the data. If the drive does show up in device manager and disk managment interfaces but not as a discrete drive letter in "Computer" list then there is a chance that software based rocovery could recover some data if the heads and platters and motors are still working at design spec. TK has a point: if the disk can been seen in disk managment, then there is a change. BUT, Windows acts sometimes different with disk then Linux does. This link is about a drive, not recognized by Windows and good for Linux. So after trying recover-software made for Windows, give a Linux boot CD with a recovery a change. Most of them are free of charge. dudi, TK has a point: if the disk can been seen in disk managment, then there is a change. BUT, Windows acts sometimes different with disk then Linux does. And there is a site with the best system rescue discs and all of them are based on Linux: https://lifehacker.com/5984707/5984707/five-best-system-rescue-discs This link is about a drive, not recognized by Windows and good for Linux. So after trying recover-software made for Windows, give a Linux boot CD with a recovery a change. Most of them are free of charge. NO need to unlock your device to see your calendar events! Play, send, receive multiple movie files. Your secure and private diary of life's best moments, GRATITUDE is scientifically proven to drastically change lives. HanYou allows you to instantaneously translate Chinese characters and text into English using the Camera. The most amazing photo realistic art 3D live wallpaper. We have the winning patterns!